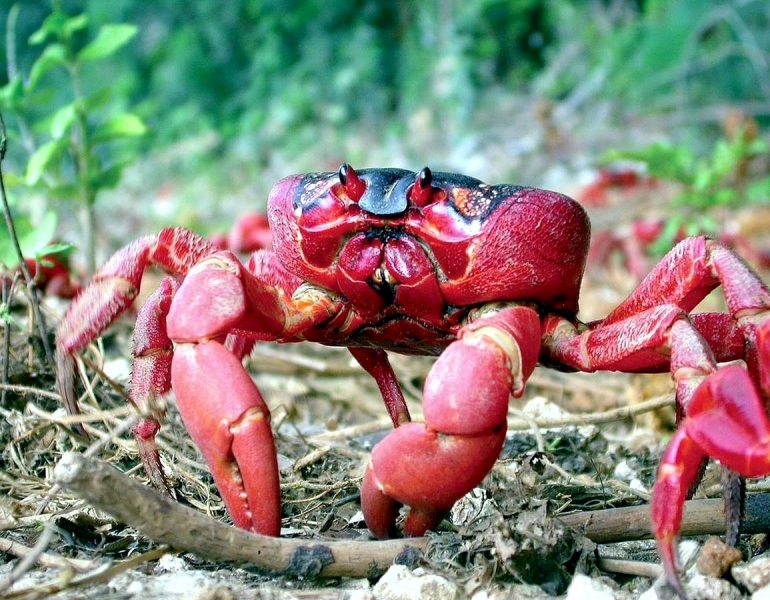 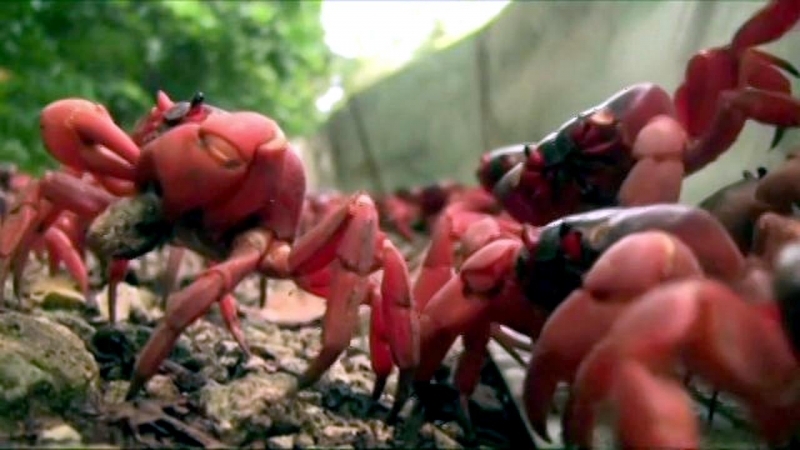 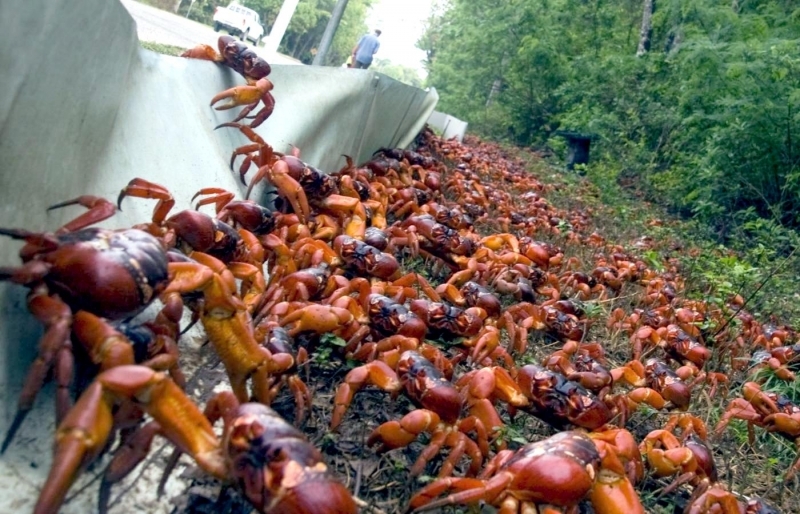 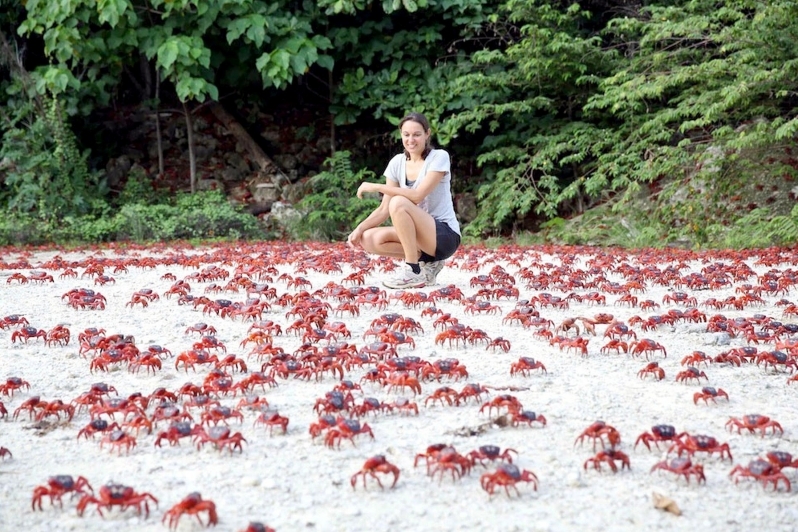 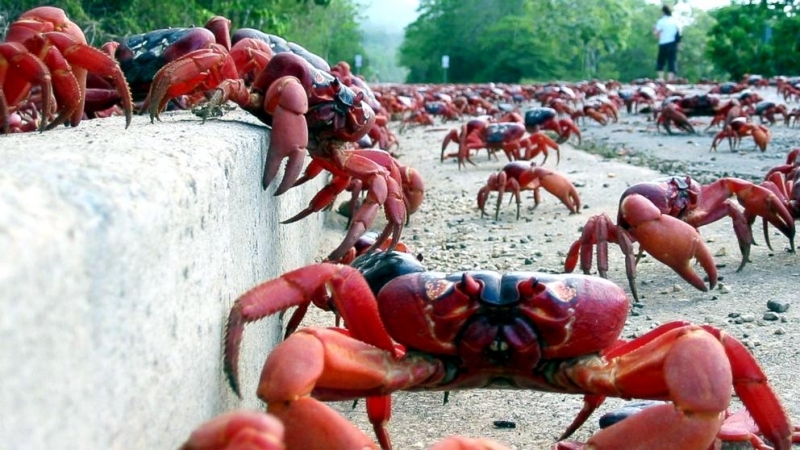 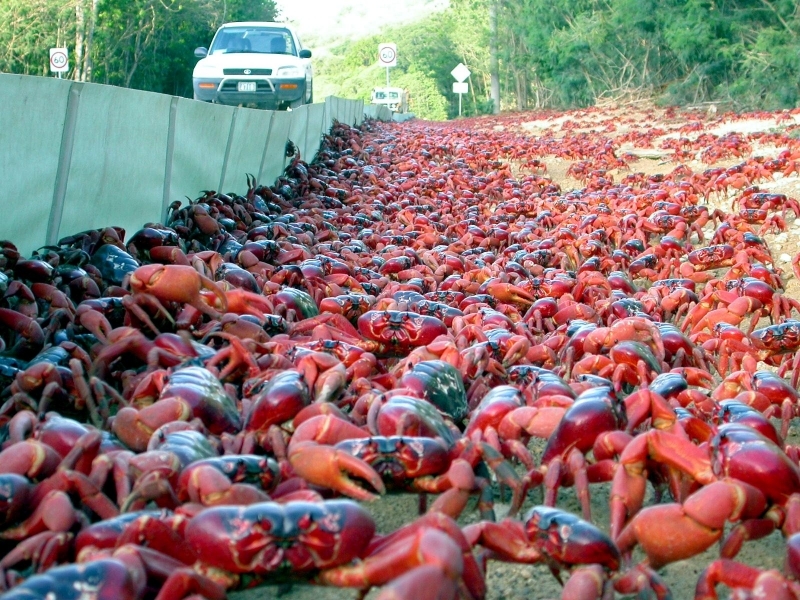 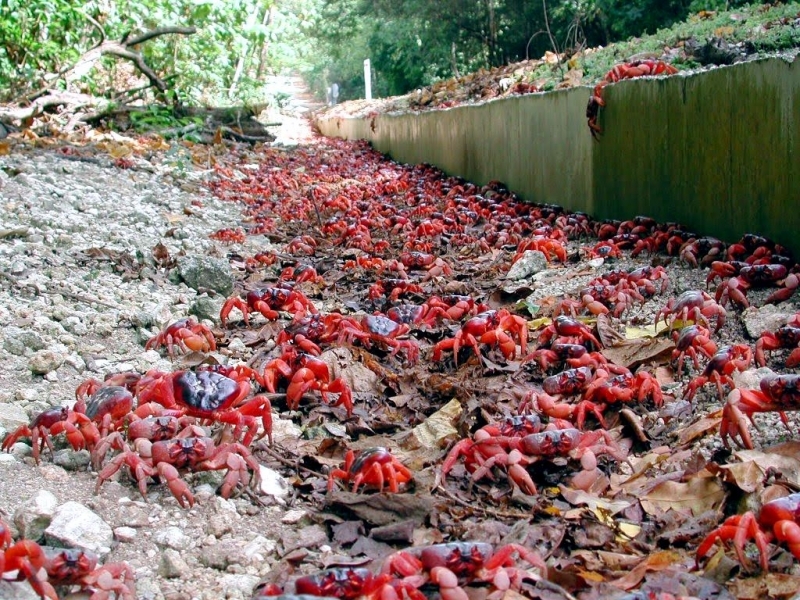 About 120 million Red Crabs live on Christmas Island and undertake one of the most spectacular migrations of the animal world. 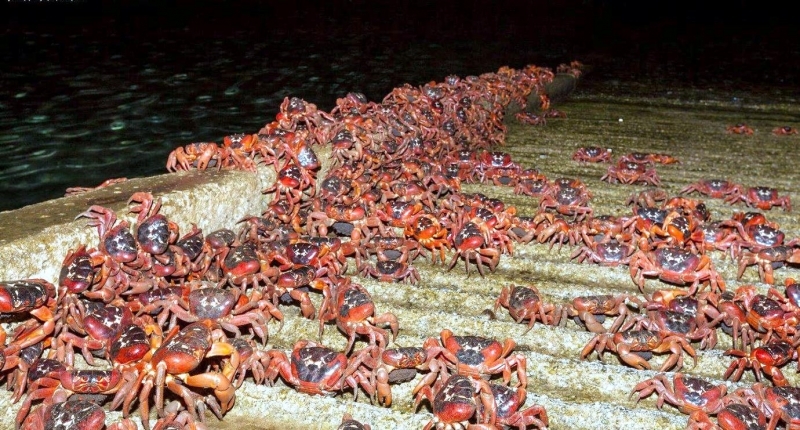 When the rains come, they leave their forest habitat and descend en masse to the sea to lay their eggs. 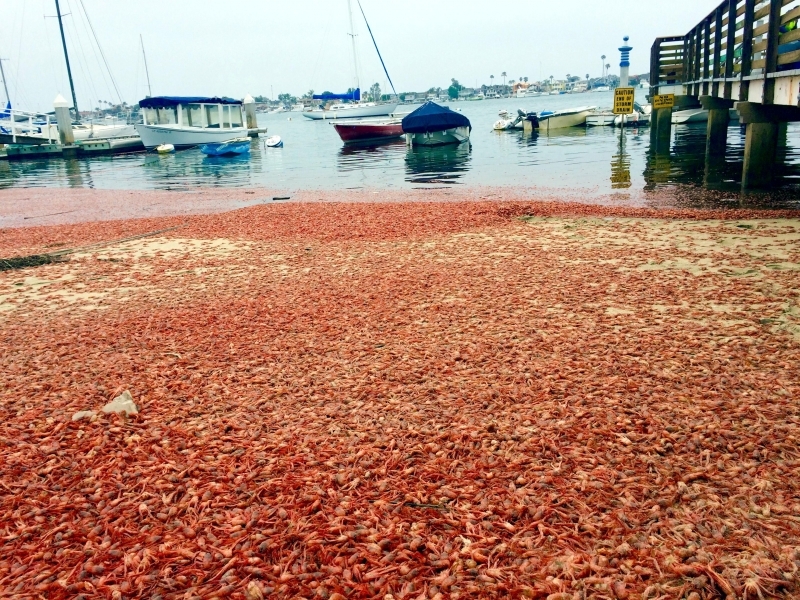 About a month later if conditions are good, millions of tiny larvae retrace the adults’ steps emerging from the ocean like a red swarm. 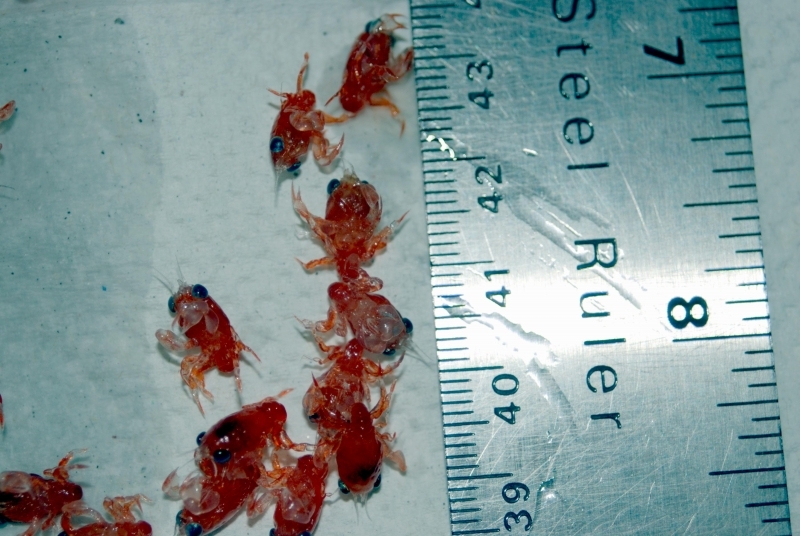 They can live for over 12 years. 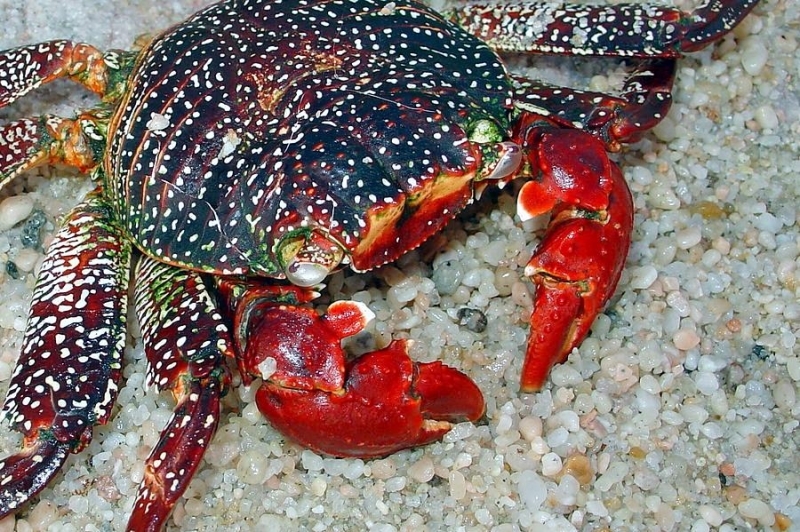 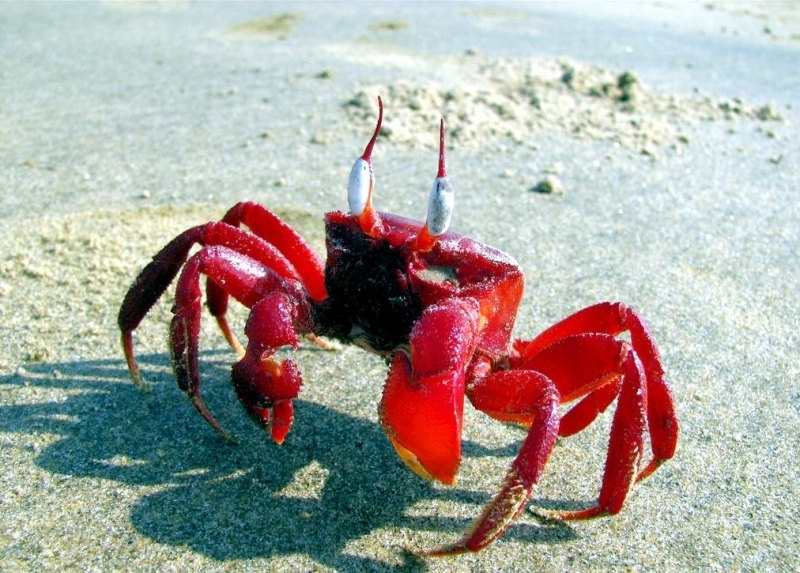 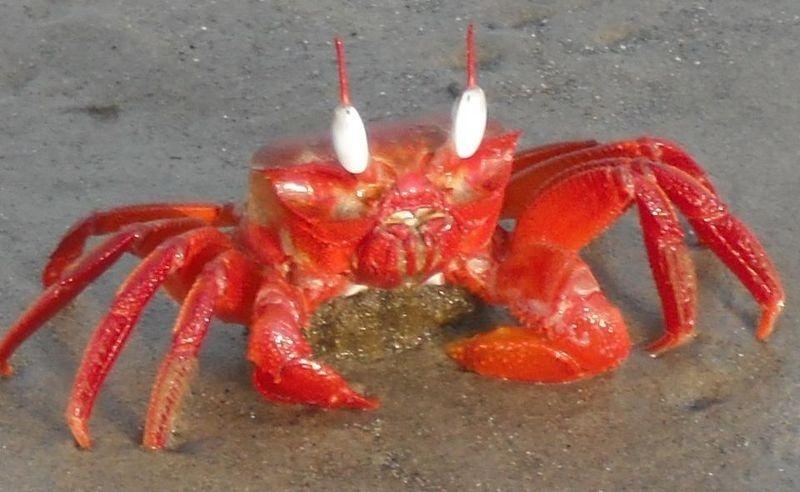 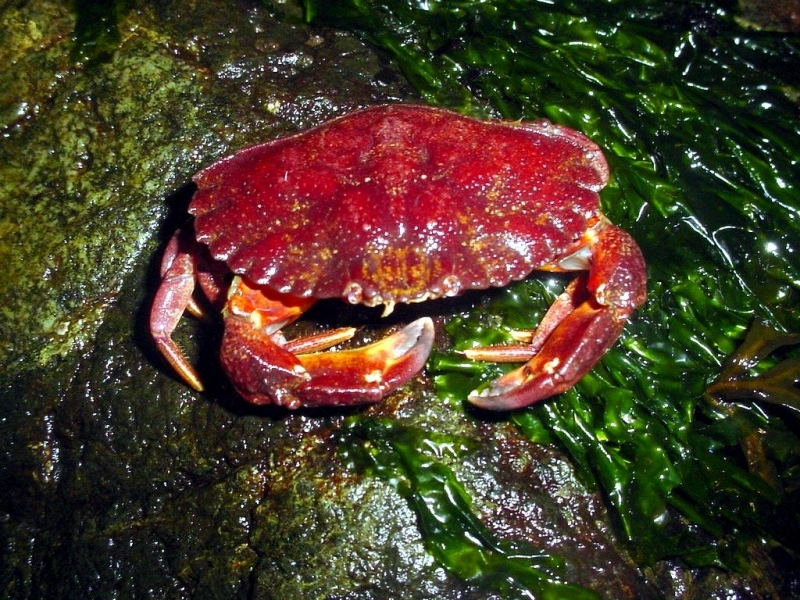 Red Crabs are 4.7 inches in length and weigh 17.6 ounces. 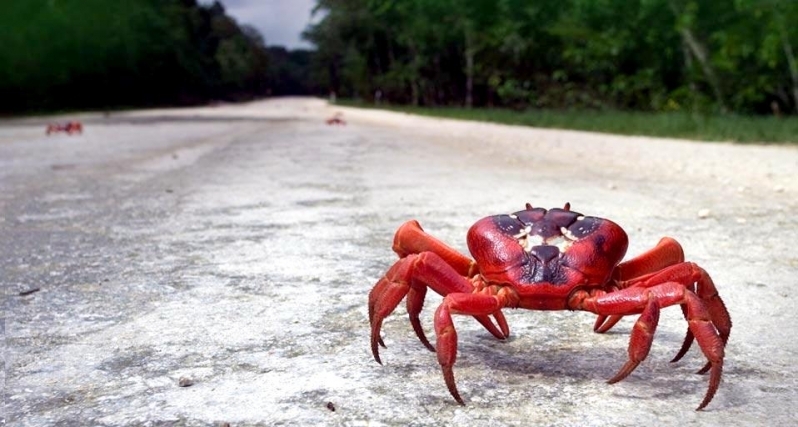 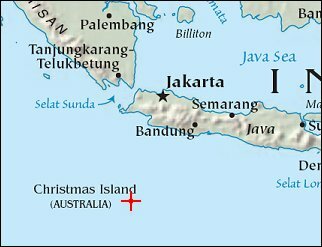 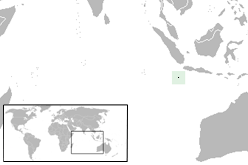 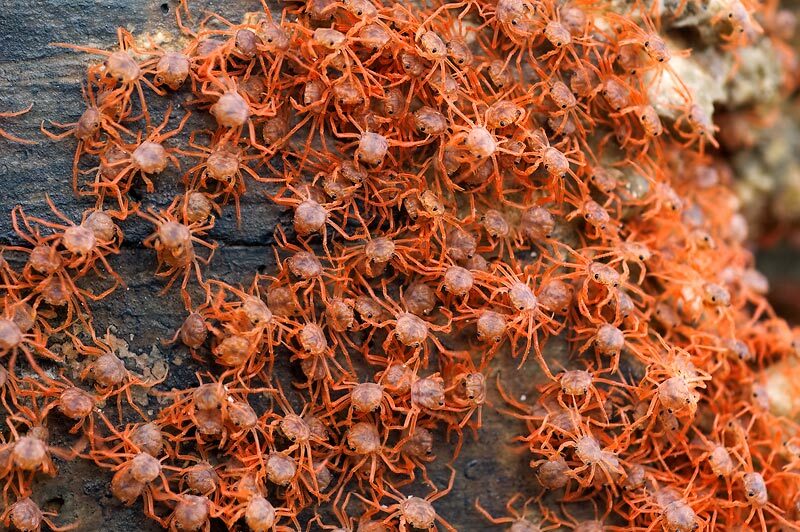 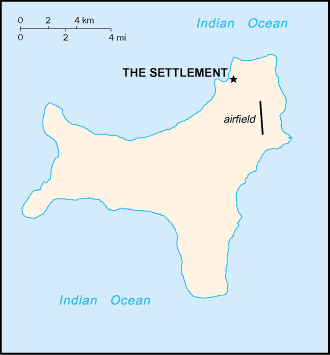 They are found on Christmas Island, a tiny island in the Indian Ocean northwest of Australia. 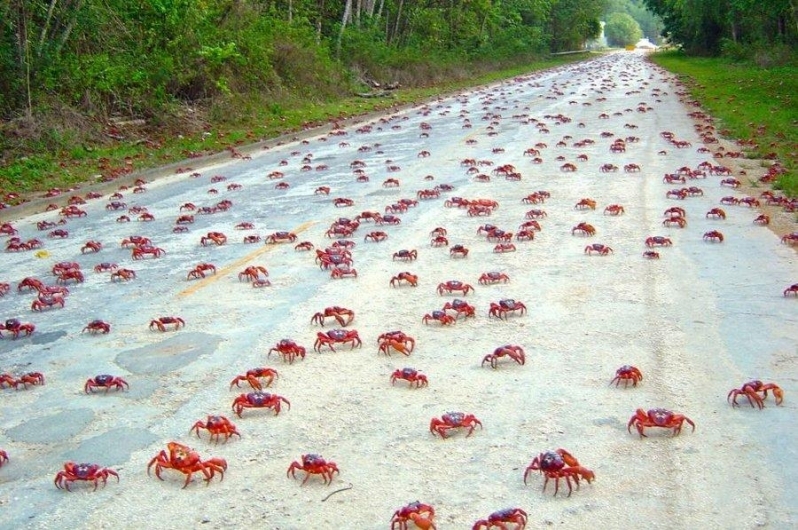 These are quite terrestrial crabs, living on the moist rain forest floor. 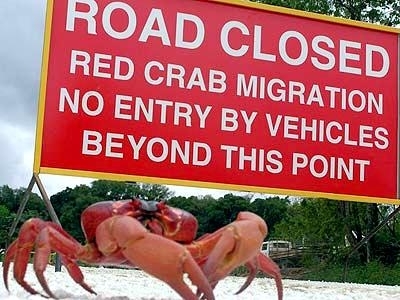 They migrate to the ocean to breed. 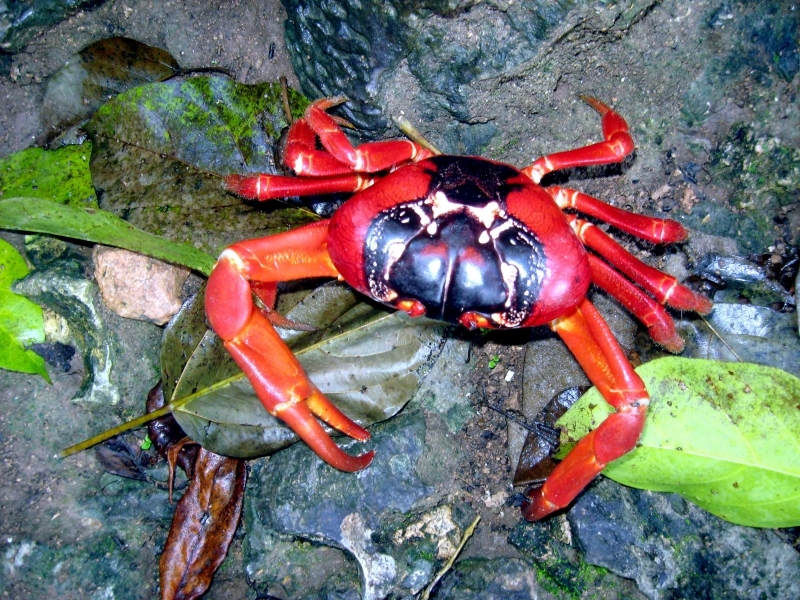 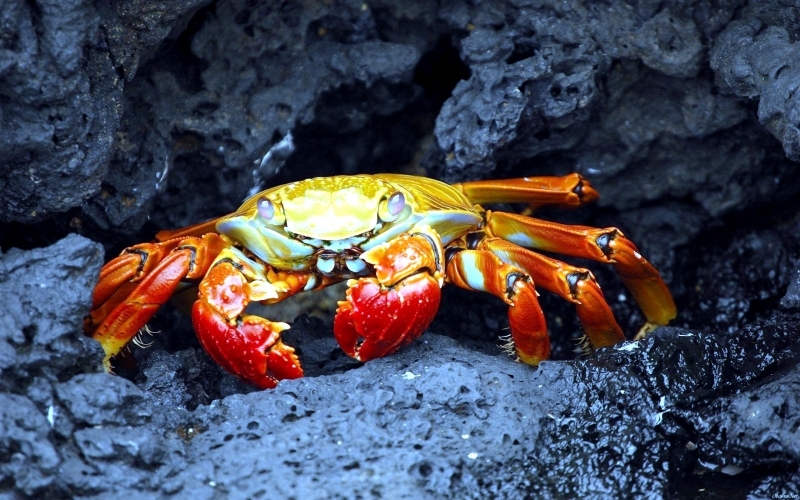 Red Crabs are largely vegetarian, but opportunistic and will eat members of the same species that get run over during migration. 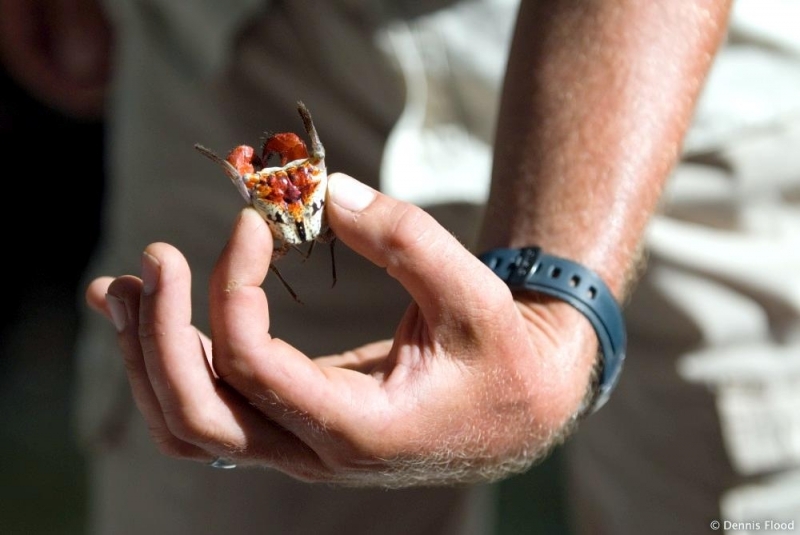 They prefer green leaves, sometimes stretching up to lower branches for them but also eat dead leaves. 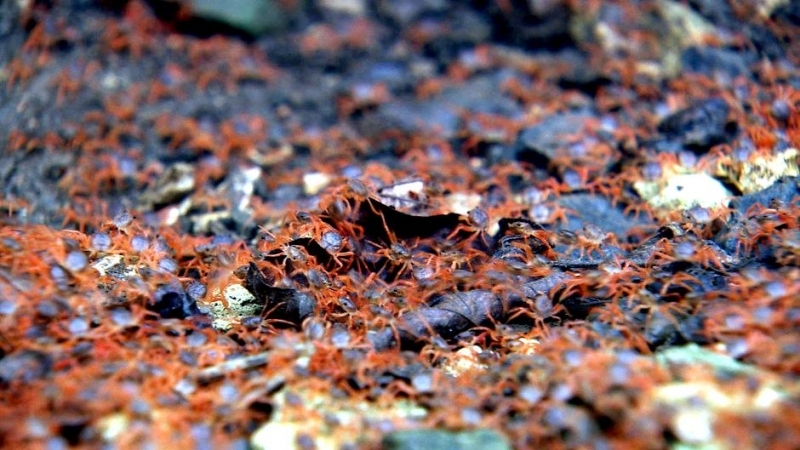 Occasionally, they consume the bark from saplings. 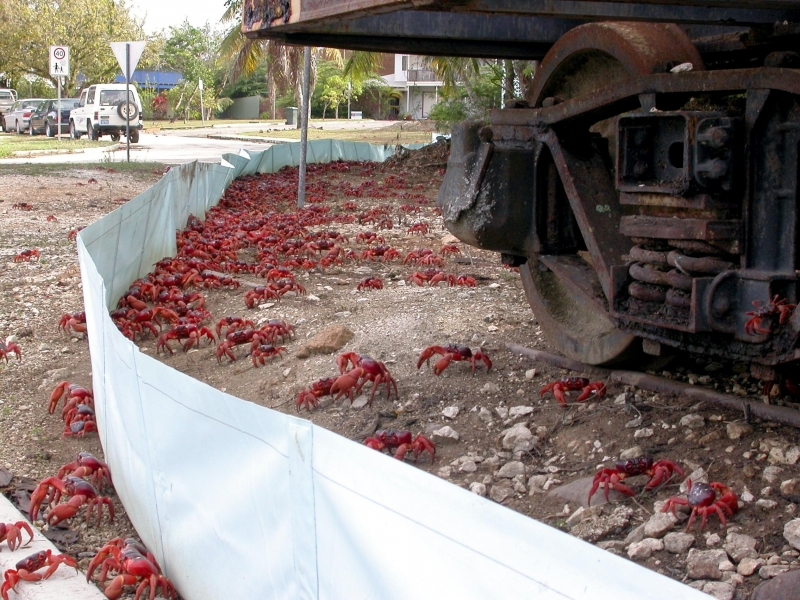 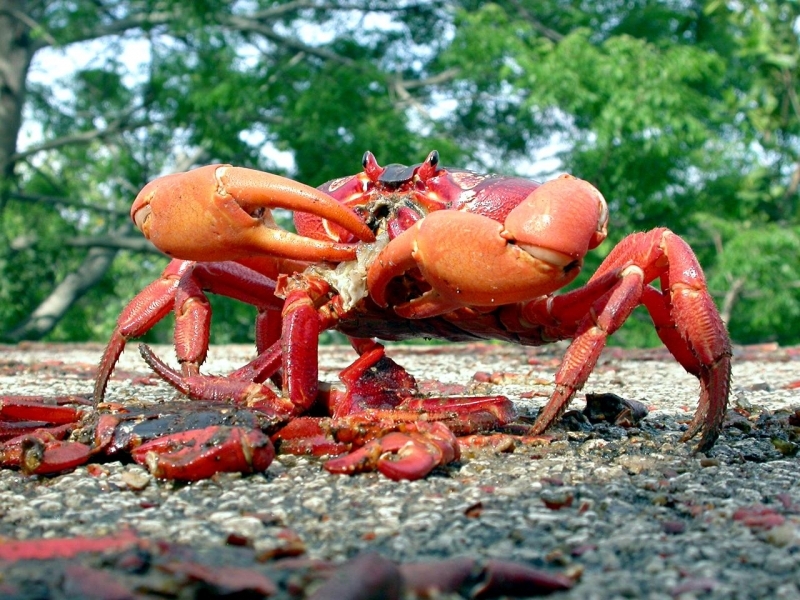 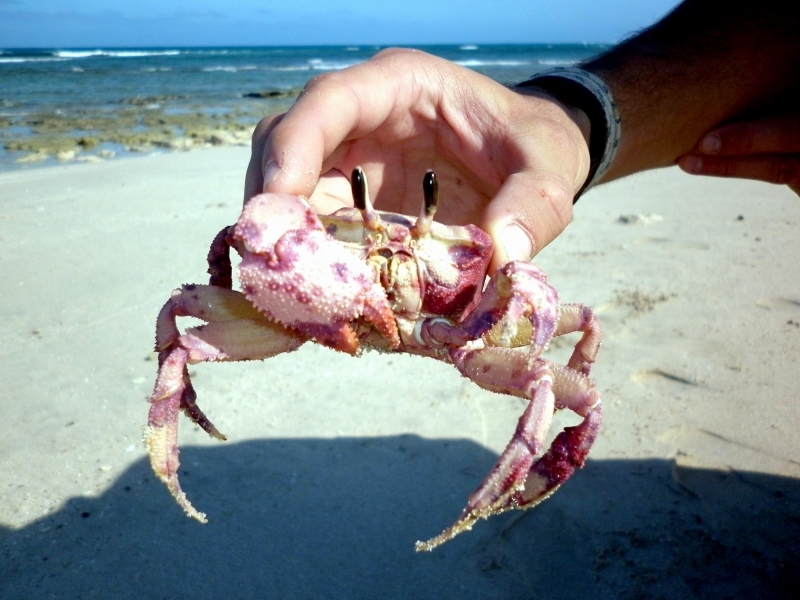 Christmas Island Red Crabs are diurnal and hide in cool, moist burrows in the midday heat to avoid drying out. 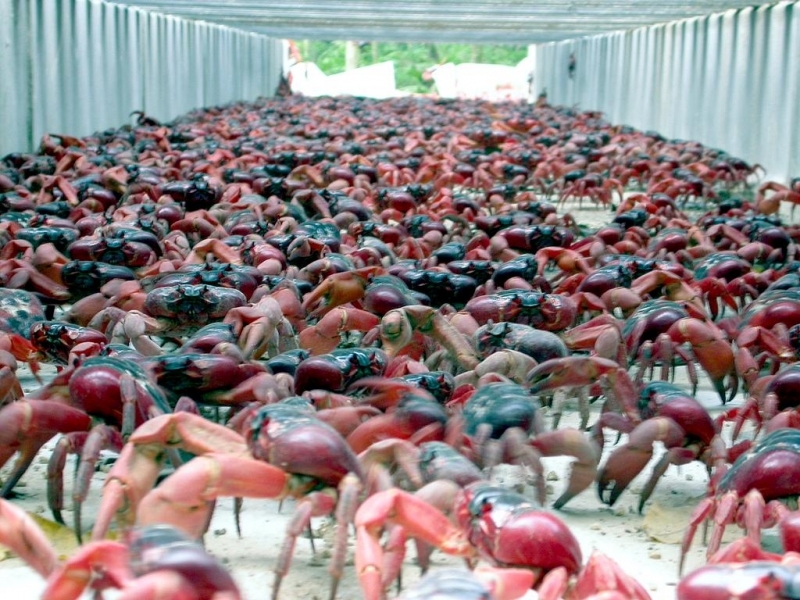 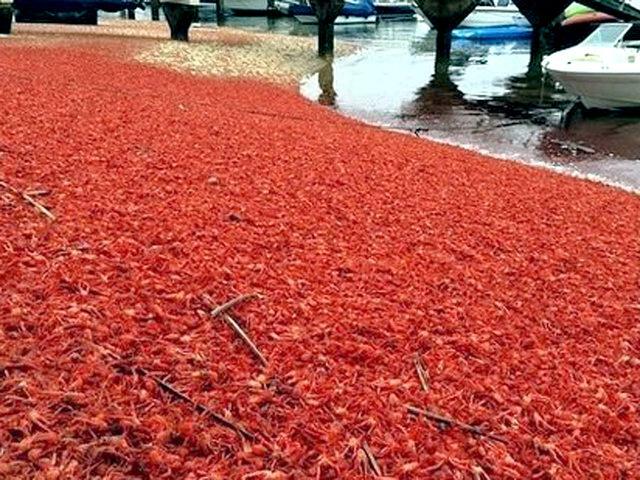 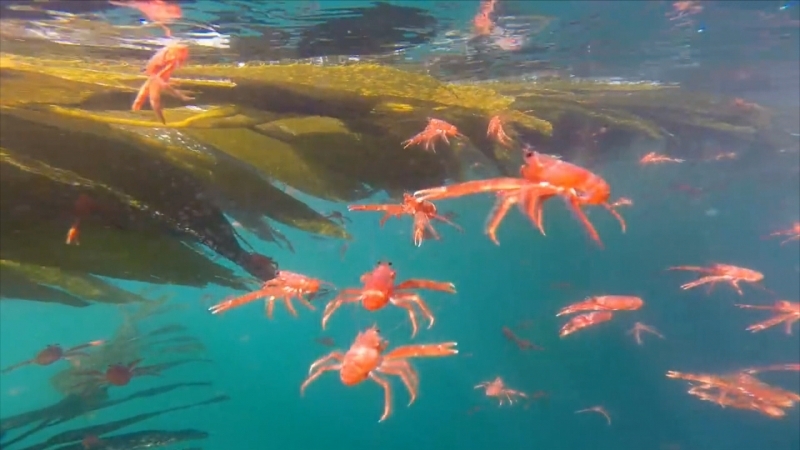 Every year after the start of the wet season, a spectacular Red Crab migration takes place when thousands travel together to the sea to spawn led by the males. 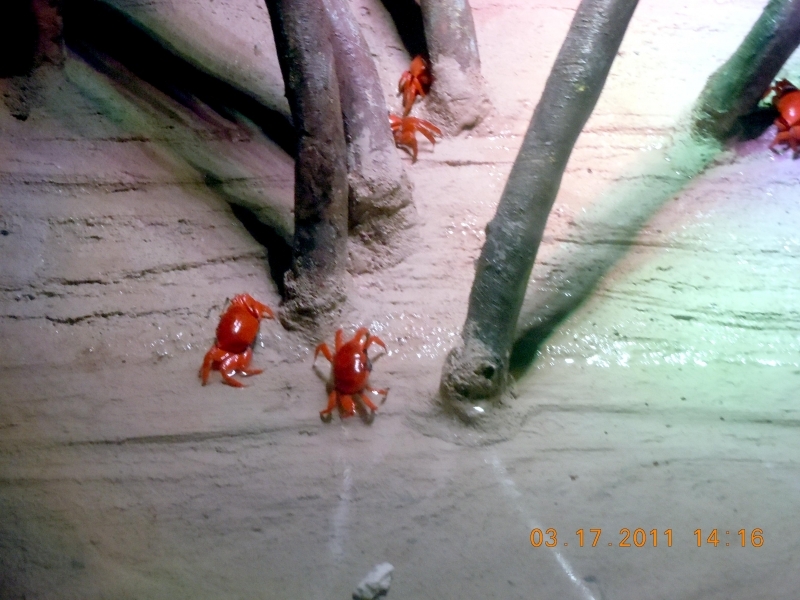 The Red Crabs may then ‘dip’ either on the damp sand or in the surf, replenishing moisture & salts lost on the migration before building burrows. 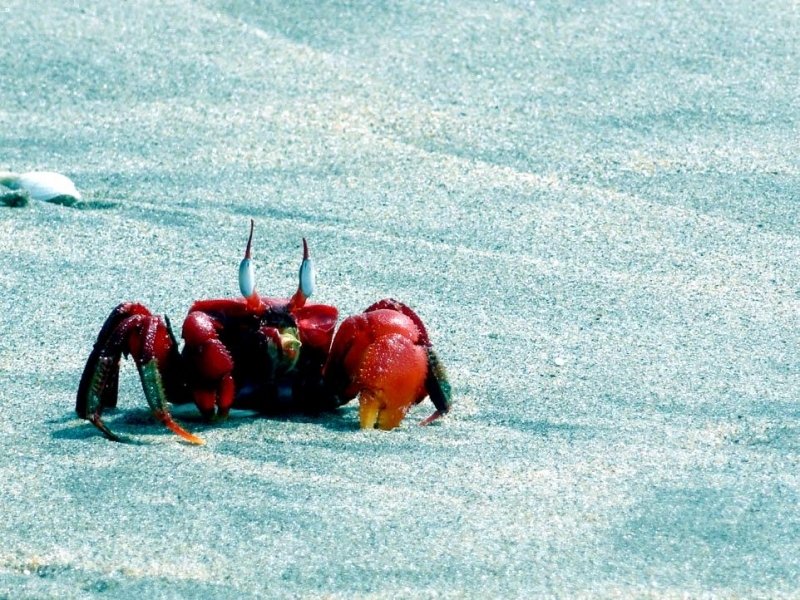 Upon migrating to the ocean side, the male digs a burrow in which mating occurs. 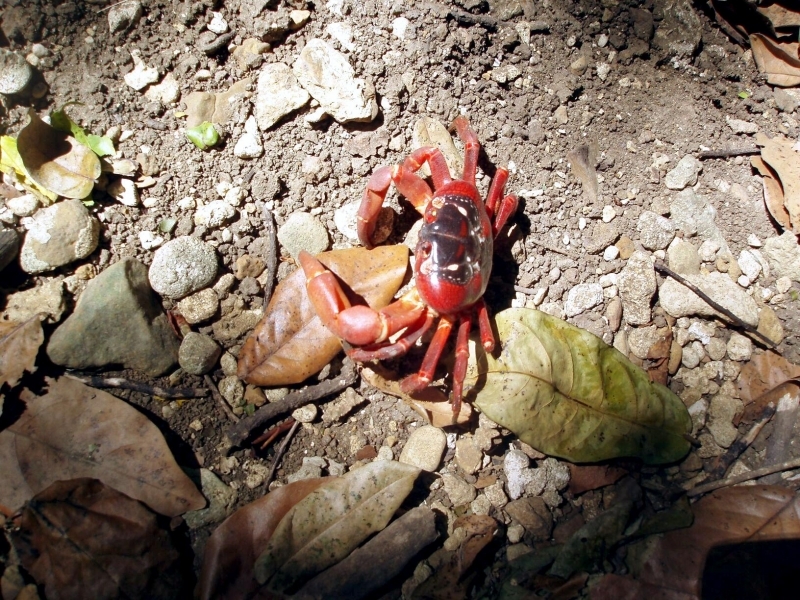 He then returns to the forest, leaving the female in the burrow where she broods the eggs in a pouch on her abdomen. 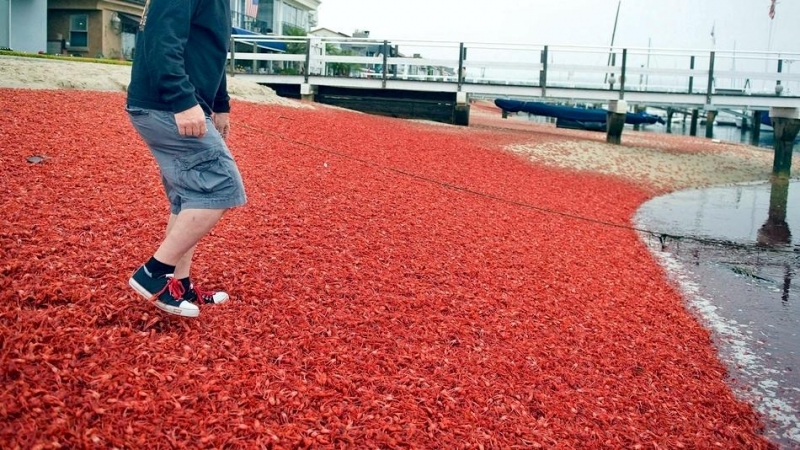 After about 12 days when the tide is low, she releases around 100,000 eggs into the sea. 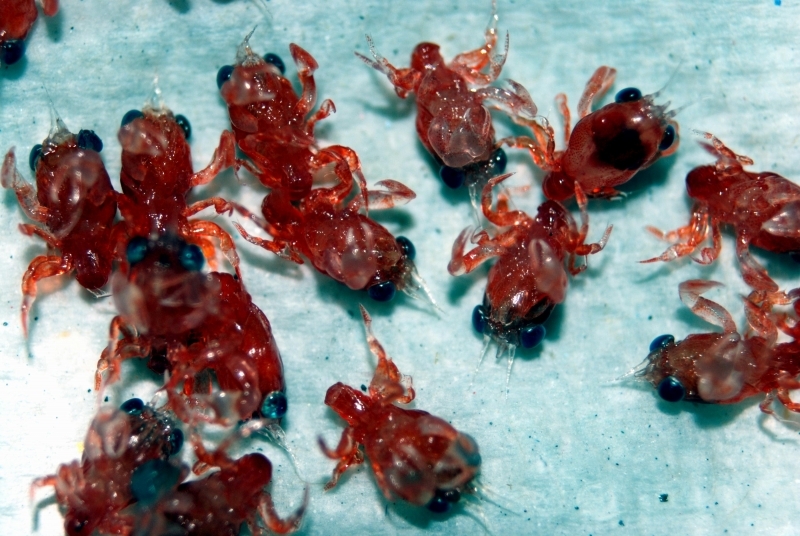 These hatch immediately into tiny larvae. 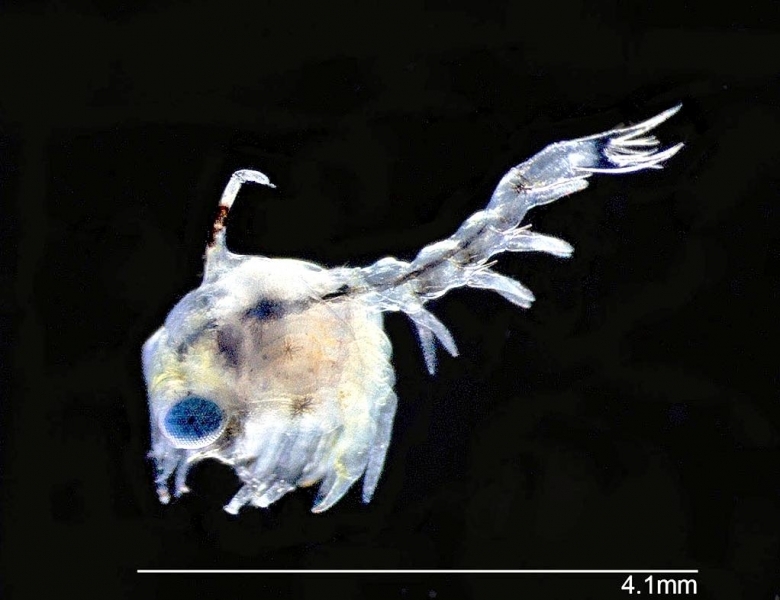 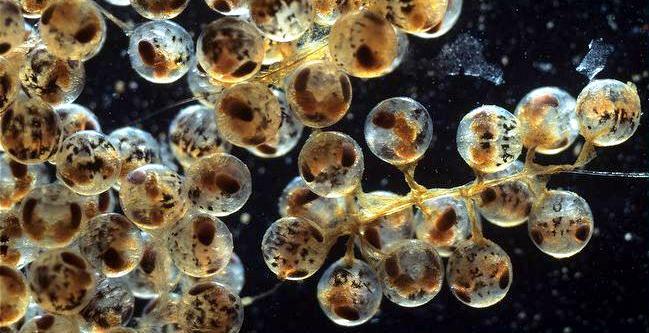 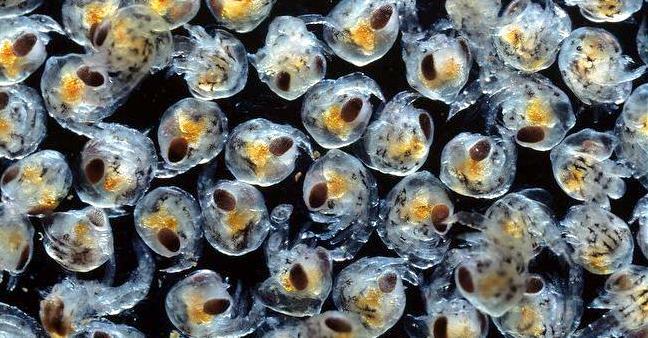 The larvae stay at sea for around a month, during which time they undergo different larval phases. 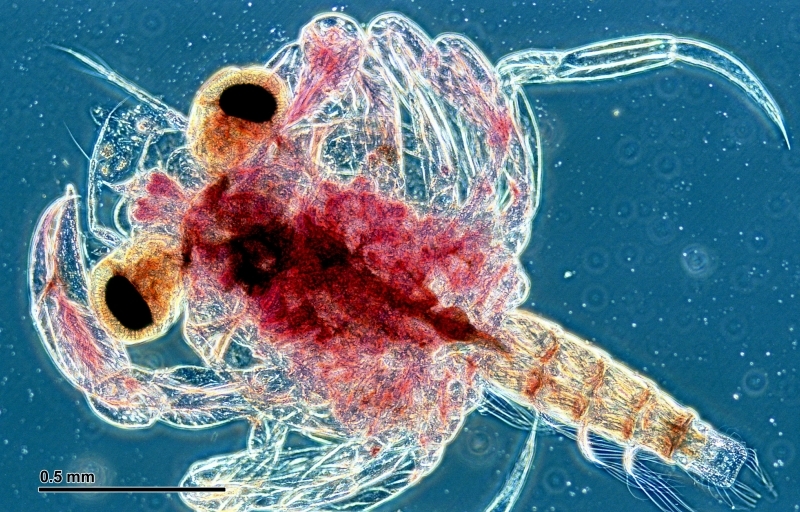 The final larval molt produces air-breathing larvae around 5 millimeters long, that begin to make their way back to land. 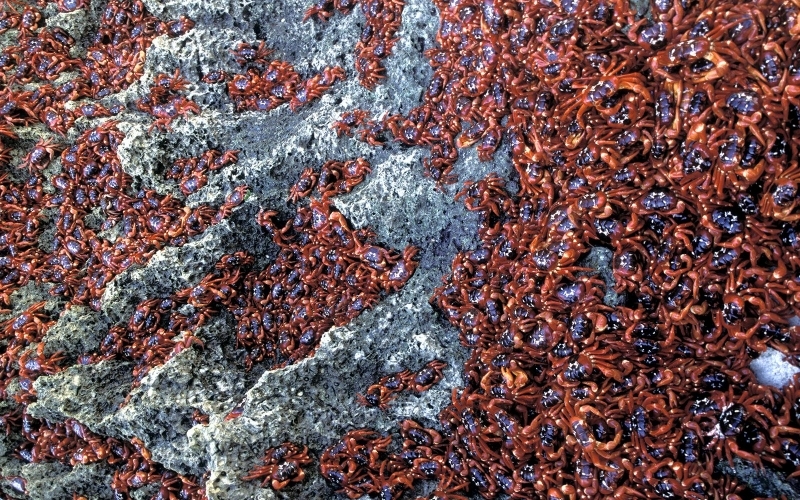 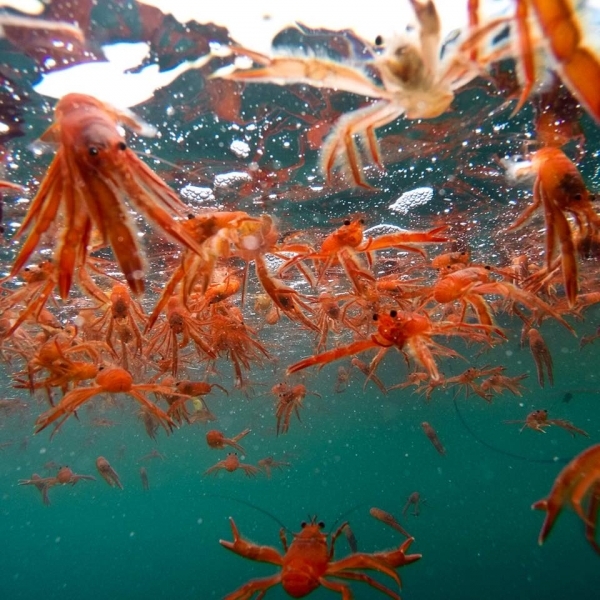 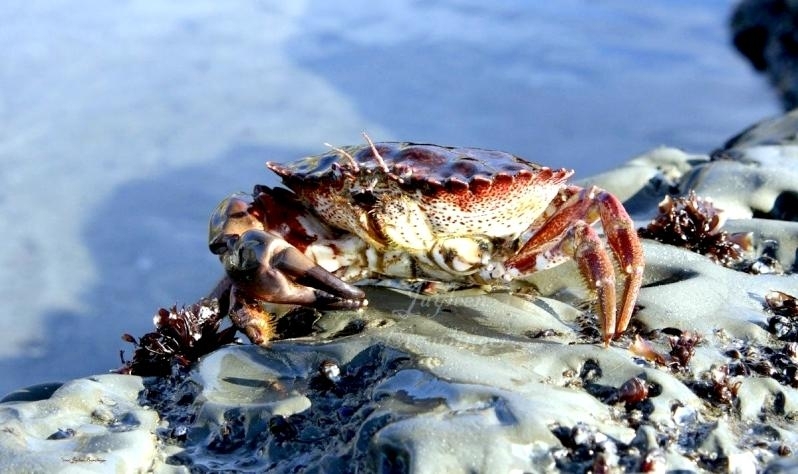 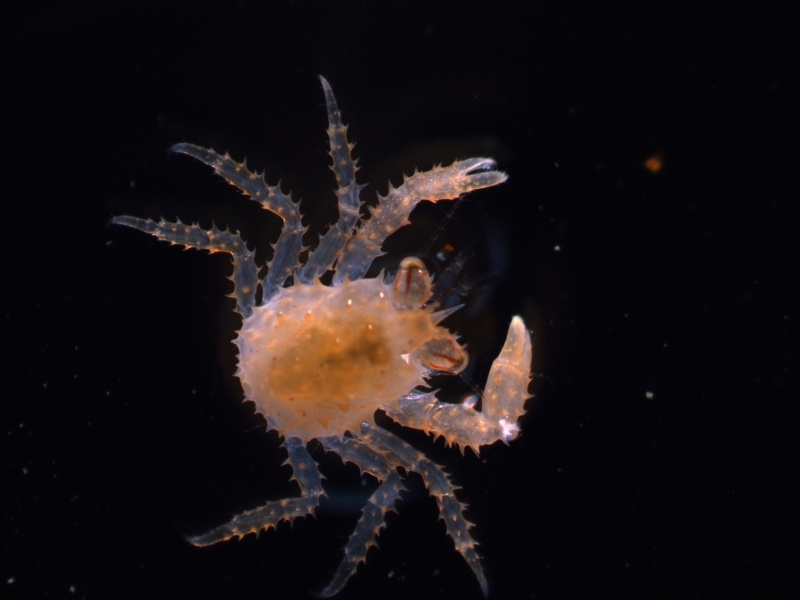 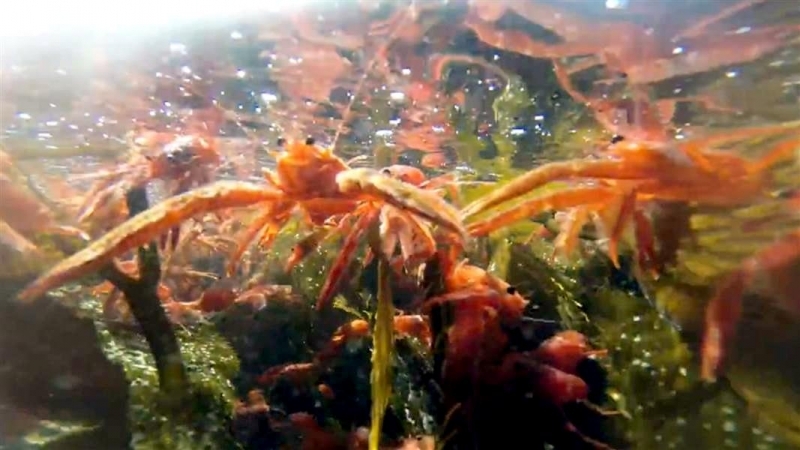 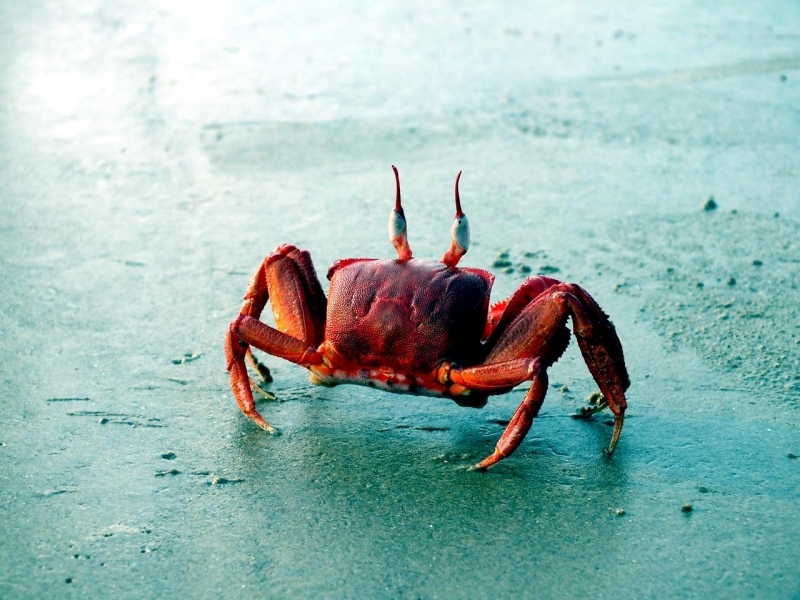 In many years, few or no Red Crab larvae return to the shore with large numbers successfully returning only once or twice a decade. 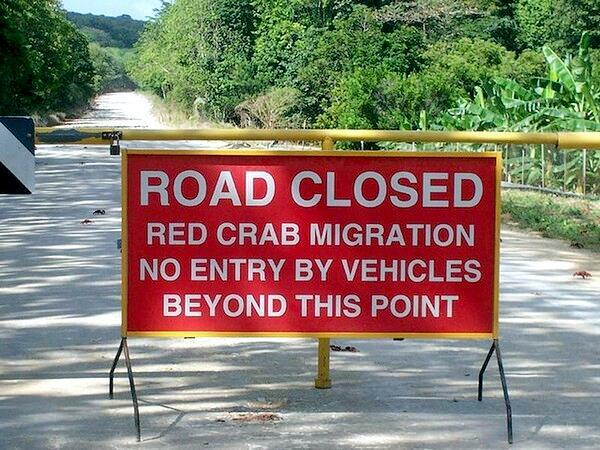 This low success rate is sufficient however to maintain the population. 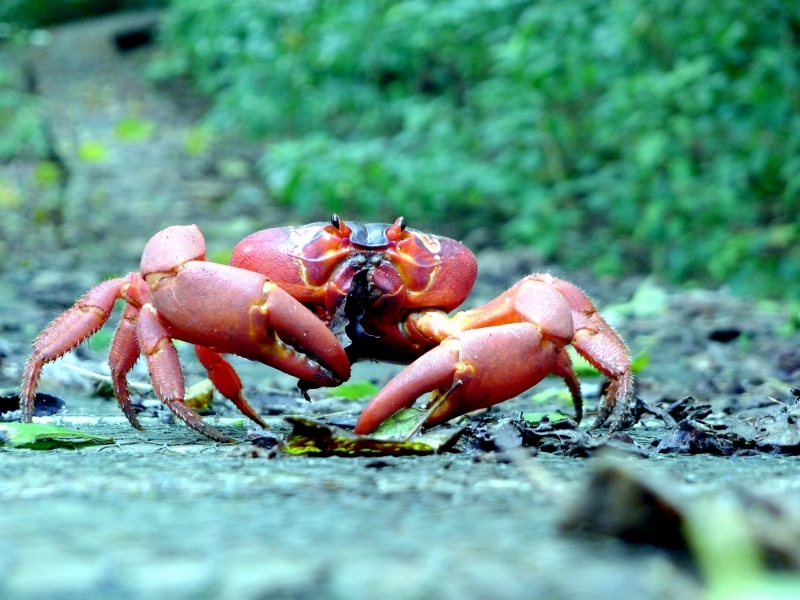 Human activities such as forest clearing & development have had an impact on this species. 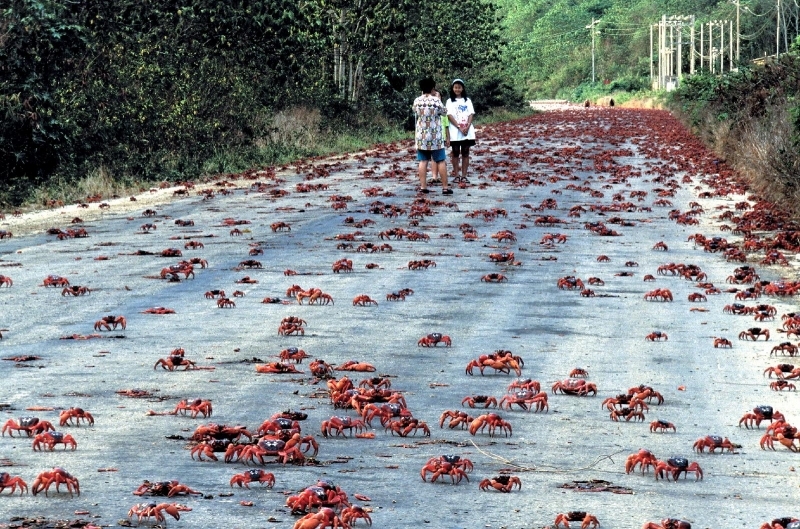 Many are killed on roads or dehydrate while crossing large dry areas. 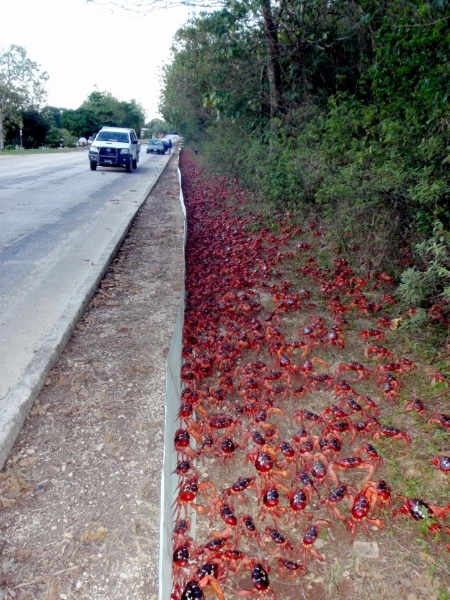 However, measures are in place to reduce the numbers killed. 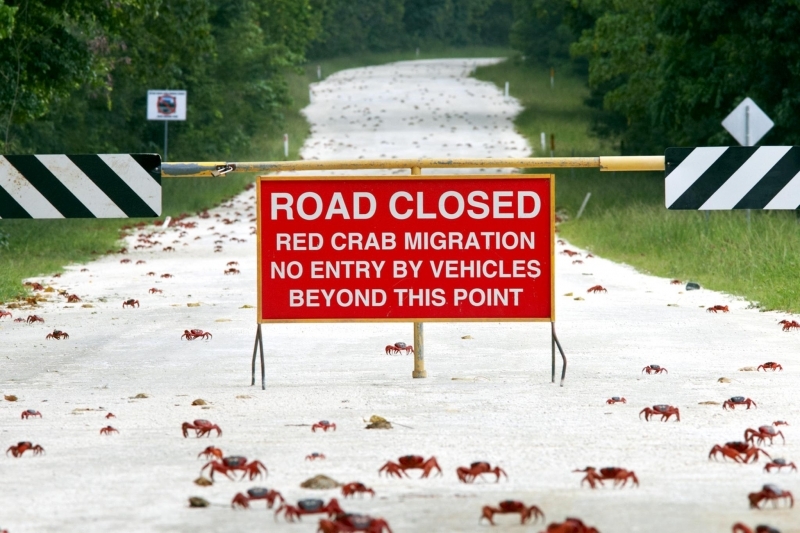 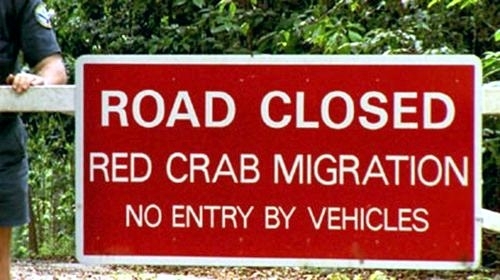 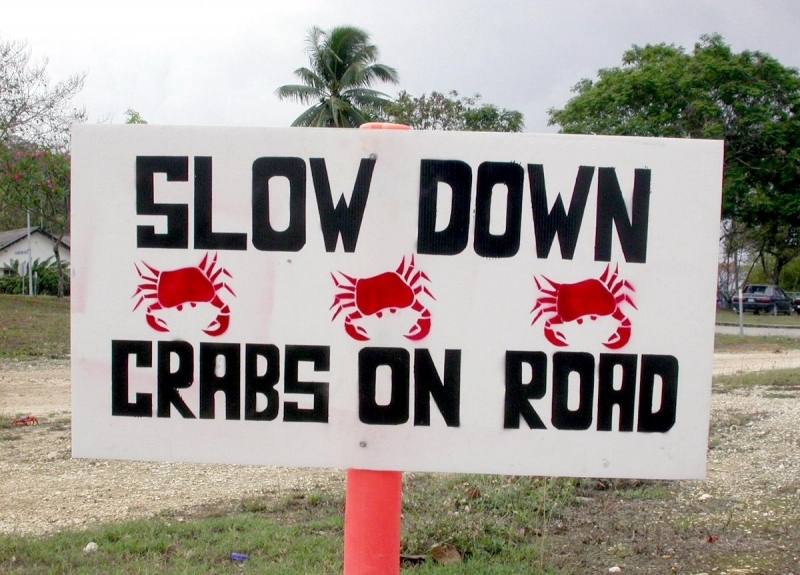 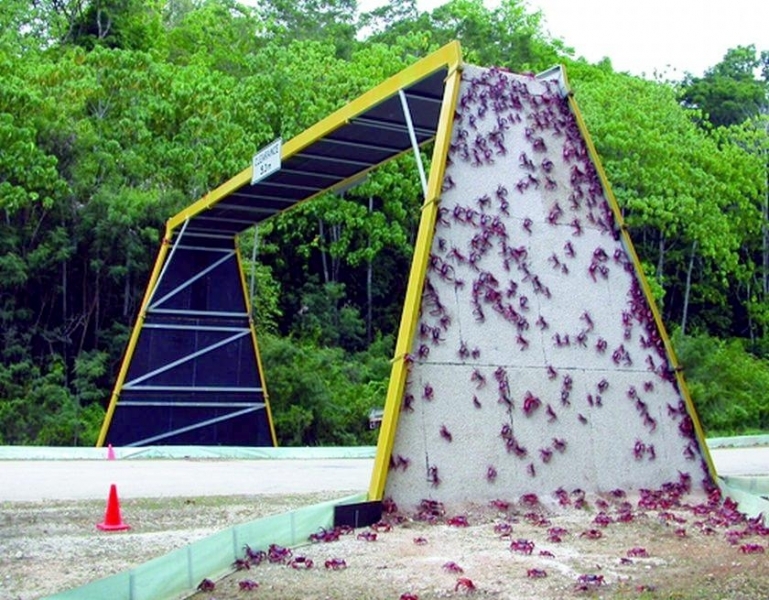 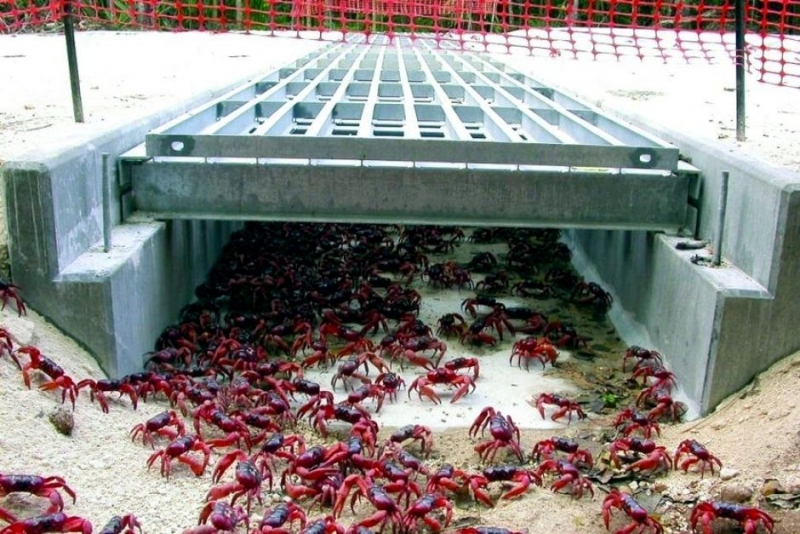 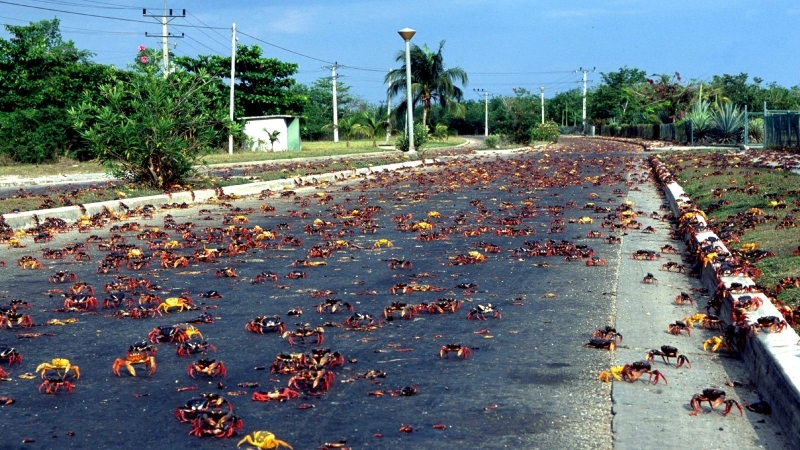 Red Crab crossings have been built across some roads on migration routes while in other areas, roads are closed around the time of migration.